On a team with a bevy of talented players, somebody is bound to be overlooked. Last summer, Shepard wasn't selected for the Boost Mobile Elite 24, nor was he selected for this year's McDonald's or Jordan Brand games. A three-year performer, Shepard has had an All-American season and has been the Pilots' most consistent player, averaging 15.5 points, 7 rebounds and 6.9 assists, setting the program's single-season record for dimes in the process. This from a 6-foot-8 player who began his high school career playing power forward. The No. 53 player in the ESPNU 100 also has a reputation as one of the nation's finest defenders. The recent San Diego State recruit was lauded for his defensive work on Shabazz Muhammad and Jabari Parker, arguably the nation's two best players. The Pilots played one of the nation's most challenging schedules, the norm since the program was first eligible for the FAB 50 in 2008-09. They knocked off Marcus (TX) 47-39 on the road and were 13-0 going into a game against NHSI participant La Lumiere (IN) played in South Dakota. Plenty came out of that 67-66 loss. "We didn't play well and we didn't have a sense of urgency early," Peck said. "Anthony wasn't 100 percent in that game and his hurt hamstring reared its ugly head. Since then we found a good mix. We probably needed that to happen to this group." Since that game, Bennett and fellow McDonald's All-American forward Brandon Ashley have missed numerous games, but the Pilots jelled when they went to a smaller, perimeter-oriented lineup. 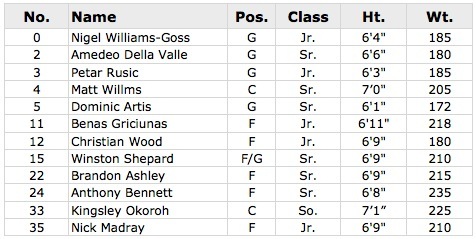 Findlay Prep played only two games within a single-digit margin all season long. They were especially impressive in back-to-back wins over Simeon (IL) and Bishop Gorman (NV) and beat the preseason No. 1 ranked team of three major rankings services.